Once again the Crawley family is crawling back to our screens bringing their wealth, their servants and their pretensions into a fourth season of the PBS blockbuster "Downton Abbey". With last season attracting some 120 million international viewers, the producers have already committed to season five. This interest in all things Downton has not gone unnoticed by British tourism. Oxfordshire, where most of the series has been shot, is only about a 90-minute drive from London and the shoot locations have become popular attractions. Show settings like Highclere Castle in Berkshire, Greys Court near Henley and Inverary Castle in the Argyll region of Scotland all have long histories that dwarf the dramatic twists of any television show. One of the pleasant surprises of visiting these locations is how much more interesting they are in their own right. The Visit Oxfordshire website features a downloadable map of Downton Abbey locations. One such location, Downton Village is actually the village of Bampton, where visitors can see several locations including the pub, the post office and St. Mary the Virgin, a 12th century church that held a Downton wedding and a funeral; Greys Court near Henley, an ancient National Trust protected home, was used for an episode that included a picnic. 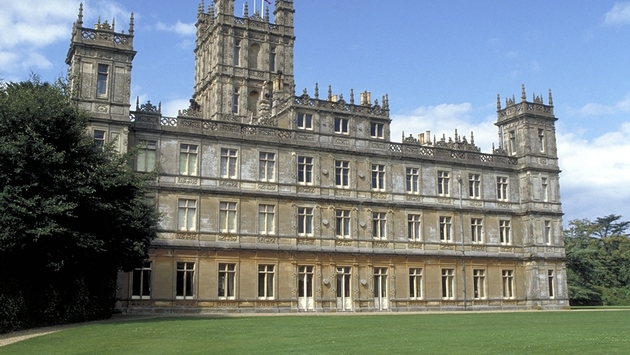 Highclere Castle, the primary setting of the show, opens for visitors on certain dates (tickets for summer will be released through the castle’s website in February). Owned by Lord and Lady Carnavon, the house still has the extensive Egyptian collection that a former Lord Carnavon brought home in the 1920s from his Egyptian trip accompanying Howard Carter, the man who discovered King Tut’s tomb. Many of the rooms are exactly as they appear in Downton Abbey, particularly the Red Room (Lady Mary’s bedroom) and Lord Grantham’s study. Long before Maggie Smith began prowling Byfleet Manor as the charmingly wicked Dowager Countess Violet Crawley; it was a home to the young Henry VIII and to Catherine of Aragon. Queen Elizabeth I also spent some time there. As the home of the Dukes of Argyll and the seat of the Clan Campbell, the real Inverary is far more interesting than any made up TV castle could be. The castle’s 16-acre garden comes to life in spring when formal lawns and flowerbeds come to life. BritMovieTours specializes in taking visitors to Britain’s film locations whether they’re from Harry Potter, Dr. Who, James Bond, the Game of Thrones or Downton Abbey. The company offers Downton tours of varying lengths. The shortest, the nine-hour "Downton Abbey" Tour is priced from £95 for adults and £85 for children. So far, the company has listed four scheduled departures for the tour: April 13, July 20 and 27 and Aug. 17. Groups meet at 9 a.m. at the Gloucester Road Tube London Underground Station (District, Circle and Piccadilly lines). The guide stands outside Flowers Inc. The company also offers a three-day Downton Abbey Tour & Experience. According to VisitBritain, castles, stately homes and famous buildings are visited on nearly 30 percent of all trips to Britain, amounting to about £6.5 billion in revenues. Buildings used in popular film and television productions become even more in demand. Alnwick Castle, the home of Harry Potter, had a 230 percent increase in visitor numbers since 2011.